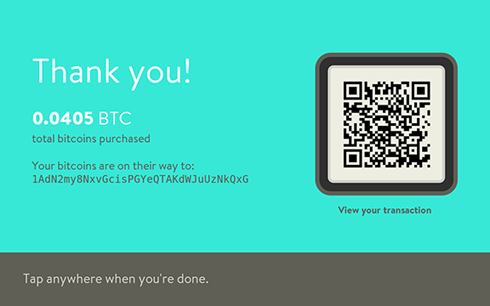 Follow these easy steps for using our Bitcoin ATM to buy a cryptocurrency. To specify the wallet address that you want the bitcoins or altcoins to be sent to, hold a wallet QR code to the window on the machine to scan it. The easiest way to do this would be with a Mobile Wallet App on your smartphone or a printed Paper Wallet. Read our guide on how to get a Bitcoin Wallet app for various mobile platforms here. Insert bills, one at time, for them to be converted. After each inserted bill, the screen will display the updated amount entered in Canadian dollars and the converted amount in your chosen cryptocurrency. We accept Canadian dollars in all denominations: $5, $10, $20, $50 and $100. We do not accept other currencies. Depending on the cryptocurrency you chose, you may be subject to a minimum purchase restriction. When you are done entering the bills for the amount that you want to purchase, press the Send Bitcoins button (or the equivalent for your cryptocurrency) on screen to initiate the transfer of the coins to your wallet. The total amount of cryptocurrency purchased. Your wallet's public address (alpha-numeric). A QR code for your transaction. If you scan this with a mobile QR code reader, it will forward you to your transaction in the blockchain (transaction database). Take a picture of this screen/QR code if you want to keep a receipt. You're done! You are the proud owner of a cryptocurrency.